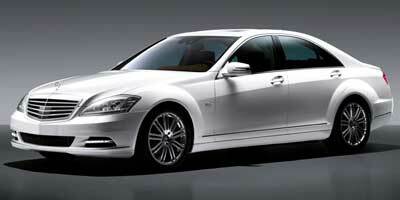 Mercedes-Benz has chosen the S-Class as the first model from the Silver Arrow to boast a hybrid variant. A next-generation lithium-ion battery is coupled to a 20-horsepower, 118 lb-ft of torque electric motor that boosts the S400 Hybrid’s fuel economy to 29 mpg combined while still producing the kind of power and finesse the S-Class is renowned for. The electric drive components in the S400 Hybrid make up a fraction of the tech onboard Mercedes-Benz’s full-size luxury liner. The S-Class comes equipped with an arsenal of safety-based technology, from awareness and lane minders to a futuristic display that alerts the driver to objects on the road ahead in low light. Where the gadgetry manages to differentiate this S from its predecessors, familial traits like muscular styling and a meticulously executed interior define this car as a Mercedes-Benz S-Class. If you’re looking for the next chapter in luxury hybrid sedans, it’s here. 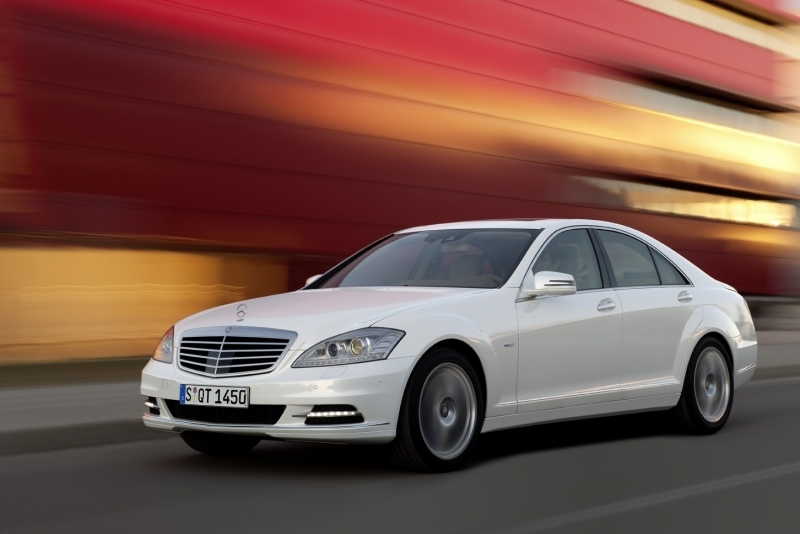 Like the rest of the S-Class lineup, the S400 Hybrid benefits from the 2010 face lift. A larger grille, massive arched fenders and attractive LED taillights differentiate this sedan from the rest of the well-dressed crowd. The hybrid drivetrain is smooth and quiet, with a near seamless transition between electric and gasoline power. The next-generation lithium-ion battery is pretty nifty. Though the combined output of the S400 Hybrid’s gasoline and electric motors sits at a respectable 295 horsepower, the car has over two tons of German engineering to lug around. The result is a car that’s decidedly less fun to drive than it’s big V-8 and V-12 brothers. Also it’s a ‘mild’ hybrid, meaning that the S-Class can’t scoot around on electric power alone. After spending some time in the new S400, it is, without a doubt, the nicest hybrid we have ever driven. You are surrounded by all the luxe effects the S-Class has come to represent, which is to say, you feel like the leader of a prosperous eco-friendly country. That said, you’re still driving a hybrid and not a 12-cylinder, twin-turbo behemoth that goes like schnell when you press on the gas. The hybrid scoots along just fine. It takes its time getting up to speed and brakes like an out of control Radio Flyer, but, if you are person of means and you want to drive a hybrid, this is the Benz for you. Mercedes-Benz has combined its 3.5-liter V-6 engine with a compact electric motor to achieve a total of 295 horsepower and 284 lb-ft of torque. While the electric bits only contribute 20 of those horses, they add a much more respectable 118 lb-ft of torque to the equation that helps to propel this massive sedan along. Compared to the more muscular offerings in the S-Class line up, the S400 hybrid seems a tad bit underpowered, but plant your foot on the accelerator and there is enough pep to take care of quick passes on the highway. A seven-speed automatic transmission sends the power to the rear wheels, ensuring that aside from an eerily quiet take-off from a dead stop, this new-age luxury craft rides just like the gasoline versions. Aside from the innovative electric drivetrain, the S400 benefits from the same level of sophistication found in the rest of the S-Class. That means neat safety tricks like a night view system that alerts the driver to unseen pedestrians, a driver awareness alert system that senses how tired the driver is and a lane minder to keep everyone inside as safe as can be. 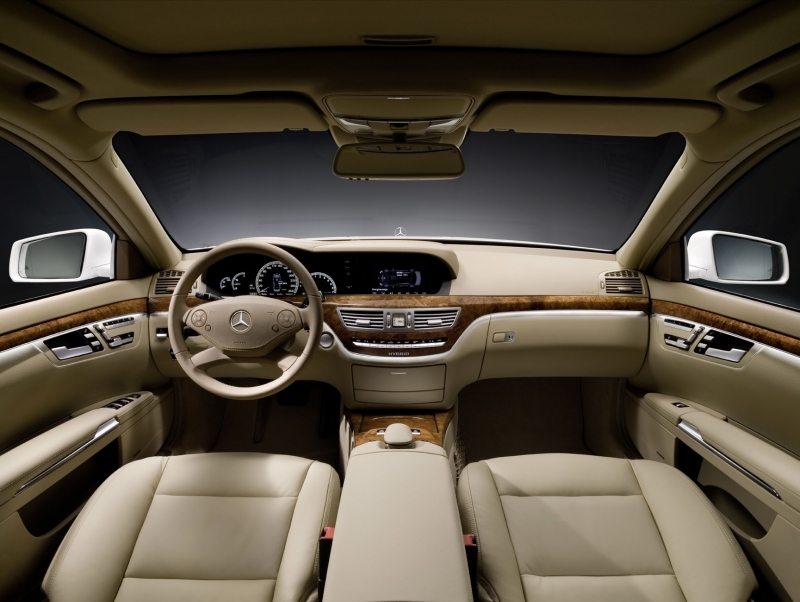 Just like the other S-Class models, the S400 Hybrid comes with a fantastic stereo. Coupled to a four-gig hard drive, the car can store plenty of music for playback later. A USB and SD card port is on hand for quick data exchanges, and a pre-loaded Zagat hotel and golf guide is also onboard. It may lack the power of the rest of the S-Class line up, but the S400 Hybrid boasts phenomenal fuel economy. Despite its girth, this luxury cruiser manages an estimated 23 mpg city and 33 mpg highway, thanks to its hybrid drivetrain. The hybrid can brag about a beautifully designed dash and center stack as well as supportive, supple leather seating. High-quality construction and attention to detail puts the S-Class a nose ahead of its competition. Despite the large ‘Hybrid’ emblem on the center stack, you’ll never forget you’re in an S-Class. The S400 Hybrid finds itself in an interesting category. On the one hand, it’s nestled into a segment loaded with high-power luxury sedans. On the other, there’s nothing out there that can boast the kind of green credentials this luxury cruiser carries. Mercedes-Benz hasn’t released any specifics at the moment, put expect to pay anywhere from $88-90,000 for the new hybrid. That puts the full-size luxury sedan in competition with cars like BMW’s 750Li sedan, as well as Audi’s A8 at $74,050. That doesn’t mean that it can’t be cross-shopped against the likes of the Lexus LS Hybrid at $109,035 or even Mercedes-Benz’s own E320 BlueTec at $54,200 as well. An odd spot to be in. With unsurpassed fuel economy for a car of this size, the S400 Hybrid is a bold step in a new direction for the German automaker. In the past, Mercedes-Benz has used the S-Class to debut now-standard tech like stability control, anti-lock brakes and airbags. Now the car is utilizing the world’s first commercial application of a lithium-ion battery. It wouldn’t surprise us to see other manufacturers follow Mercedes-Benz’s suit. Mercedes-Benz has made a good deal of fuss concerning the debut of its first hybrid, the S400 Hybrid. The car boasts the world’s first commercial application of a lithium-ion battery as opposed to the nickel-hydride units found in most manufacturers’ hybrids. The new battery tech has a number of benefits compared to more traditional units, including decreased charge time, a smaller size and less weight. Coupled to the S400 Hybrid’s smooth regenerative braking system, the batteries recuperate energy spent on sporting around on electric power. Utilizing all the power stored in the S400 Hybrid’s new battery system is a 20 horsepower, 118 lb-ft of torque electric motor. A disc-shaped motor, it can be used as both a starter and a generator, which allows the S400 to shut off its 3.5-liter V-6 engine while driving. Doing so further conserves fuel, and thanks to a near-seamless transition between all-electric, electric/gasoline and full gasoline power the driver gets a constant supply of power. 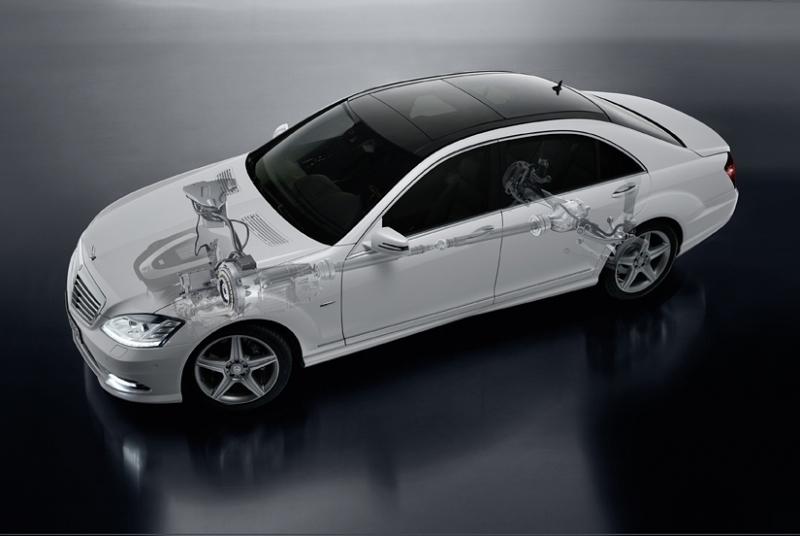 The electric motor also plays an important role in the S400 Hybrid’s braking system. When the vehicle is coming to a stop, the motor uses the energy from the vehicles brakes to generate power to store in the hybrid’s lithium-ion batteries. Mercedes-Benz spent a good deal of time working to eliminate the grabby feel of so many regenerative braking systems on the market, and the result is a car that runs and stops just like any other vehicle on the road. The combined effect is one of the most fuel-conscious luxury sedans on the planet – serving up 23 mpg city and an other-worldly 33 mpg highway. Those numbers may not seem impressive to a small-sedan owner, but considering the S400 Hybrid’s curb weight is over two-tons and it’s a ‘mild’ hybrid, that’s no small feat.